except fig. 6b, which has its own scale bar. Figs. 1-6. Dictyocoryne euclidis. Figs. 1, 3: juveniles, with strawberry-like structure at the center and a partly developed patagium in fig. 3. Fig. 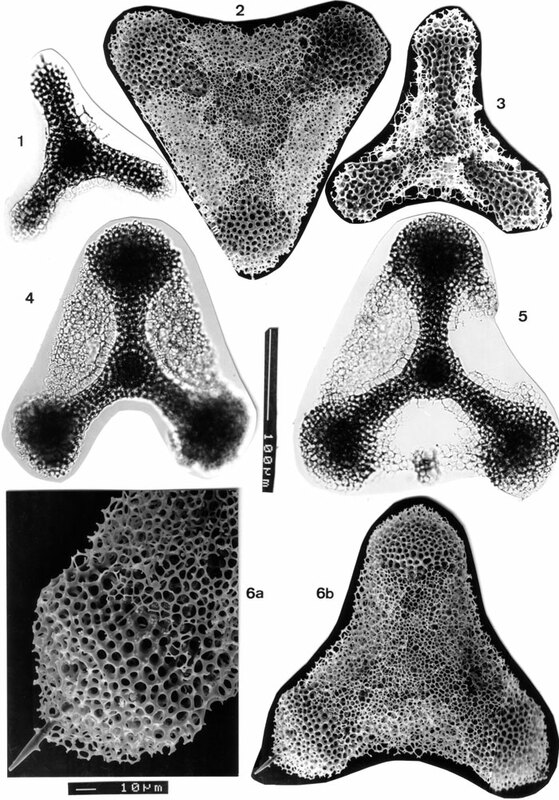 2: fully developed skeleton and patagium, showing angular pores of the more delicate central part of the patagiurn vs. circular pores of the dense outermost meshwork. Figs. 4, 5: Transmission light photos showing regular succession of first series of patagial arches following the contours of the brachial structures (see also plate 49 fig. 2). Fig. 6b: detail of terminal spine; note that the structure of the tip of the arm is much less dense than that of the main part of the arm and similarity of this structrure to that of D. abyssorum in Pl. 49, fig. 6. IOW 134(F), BSS 28B(II) (2x), BSS 26B(spongodiscid-preparate), BSS 49B(F) EF G39 and BSS 28B(II).